Congratulations to DAC spring and summer graduates! Virginia Tech graduates celebrating their achievements this spring include two Ph.D. students and three master’s students at the Discovery Analytics Center. Two Ph.D. students and one master’s student are planning to celebrate the completion of their degrees during the summer. Liangzhe Chen, advised by Aditya Prakash, received a Ph.D. in computer science. His research interests are data mining, machine learning, sequence analysis, social media analysis and critical infrastructure systems. His dissertation is on “Segmenting, Predicting and Summarizing Data Sequences.” He is joining Pinterest in San Francisco as a machine learning engineer. Reid Bixler, advised by Bert Huang, received a master’s degree in computer science and applications. Probabilistic models is his main area of research and his thesis is on “Sparse Matrix Belief Propagation.” In July, Bixler will join Amazon in Seattle, Washington, as a software engineer. Sidney Holman, advised by Chris North, received a master’s in computer science. His thesis, “Entropy and Insight: Exploring how information theory can be used to quantify sensemaking in visual analytics,” is based on his work in the Information Visualization InfoVis lab. Holman has joined Sandia National Laboratories in Albuquerque, New Mexico. Sanket Lokegaonkar, advised by Jia-Bin Huang, received a master’s degree in computer science. 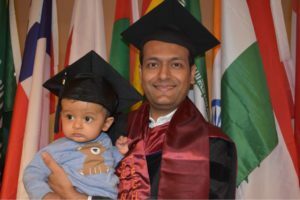 His areas of research are computer vision, continual learning, and machine learning and his thesis is on “Continual learning for Deep Dense Prediction.” Lokegaonkar worked on predicting driver state with dashboard cam and sensors with DAC and the Virginia Tech Transportation Institute. Rupinder Paul Khandpur, co–advised by Naren Ramakrishnan and Chang-Tien Lu, is planning to graduate with a Ph.D. in computer science. His area of research is applied data sciences with an emphasis on query expansion, knowledge summarization and narrative generation from structured (newspapers) and unstructured (Twitter) texts. His dissertation is on “Augmenting Dynamic Query Expansion in Microblog Texts.” After graduation, he will join Moody’s Analytics as director of artificial intelligence/machine learning. Yue Ning, advised by Naren Ramakrishnan, is planning to complete her Ph.D. in computer science this summer. Her dissertation is on “Capturing Precursors: Information Reciprocity, Event Modeling and Forecasting.” She will be joining the Department of Computer Science at Stevens Institute of Technology as a tenure-track assistant professor in the fall.